Over the years this has changed for us at Seeuferhause many times dependent on the various pieces of advice that I have received and the information that I have obtained and the most current and definitely not fad diet is an all raw, natural diet. For years now we have known that processed foods are not good for humans to consume….we are constantly bombarded with study after study surrounding the effects of diet to our well being, the effects of GMO foods, the effects of too much junk, too much sugar, too many preservatives, colourings, additives, processed etc etc….and to some extent we listen and modify our intakes accordingly. At some point we even put ourselves on diets to aid in the improvement of our overall health, weight loss and or attention to specific ailments; but, do we do the same for our dogs or do we reach for the nearest bag of kibble? pre packed meat roll? pet shop preservative laden meats? either way, we are not doing our friends any favours!! The sound of preparing a raw, all natural diet sounds laborious and over the top…but it doesn’t have to be… if you have 30 – 60 mins once per week you can give your pooch the best of the best and be sound in the knowledge that you are contributing to his/her well being and quality of life in a manner that you cannot have done with love, exercise, and training alone!! So……. Seeuferhause has the solution – a SEEUFERMIX solution! The retail cost for SEEUFERHAUSE people is $15/pack. The current pack is approx 1 kg and when mixed in the appropriate ratio of 1 part Seeufermix to 4 parts meat it makes up a total of 5 kg of food. Assuming you buy your minced chicken carcass for $2/kg your total cost of food is $4.60/kg. This is about half the cost as compared to other “premium” raw or dry foods you can buy in the pet food market! Below you will find a video that details how we make the food, how you should mix it, store it etc. the video is about 20 mins and keep in mind this is geared towards all of you Seeuferhausers! I hope you enjoy it and I hope you give this awesome food a try! 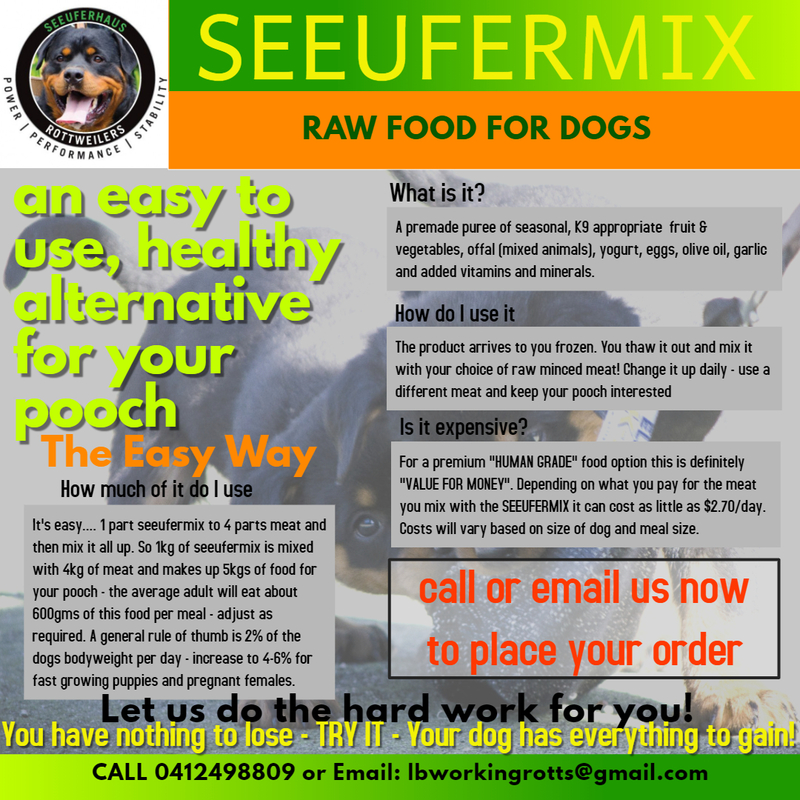 Below is a list of questions and answers that will give you a deeper understanding of the product…..
Can I feed my dog Seeufermix on it’s own? What do I mix Seeufermix with? How much Seeufermix do I mix with meat? Seeufermix needs to be mixed in the following ratio: 1 part Seeufermix to 4 parts meat – e.g. 1 kg Seeufermix with 4 kg meat makes 5 kg of food for your dog. How much of this food should I feed my dog? The amount of food required will depend on your dogs stage of life (puppy or adult), weight and activity levels; fast growing puppies, pregnant or lactating females, and working or highly energetic dogs require 4-6% of their body weight as their daily intake, and mature normal activity adults require about 2% of their body weight. e.g a 30 kg adult dog requires about 605 gm of food per day – the same size dog who is energetic of highly active may need that upped to 1 – 1.2 kg or more…. What else do I need to feed my dog? Nothing! Seeufermix combined with meat makes for a complete diet. We however recommend that some meals during the week are replaced by raw meaty bones for variety and teeth cleaning – it’ll also make it cheaper again as a complete raw diet! Seeufermix will be frozen when delivered or collected. It can be in your freezer for up to 6 months, and once thawed out it will be OK in the fridge for about 1.5 – 2 weeks. How much will I need to buy? Why should I feed raw food to my dog? Many modern studies show that raw food is the most appropriate food for your dog’s digestive system. Healthy gut = healthy dog! Many ailments in dogs are due to their diet, particularly one based on commercially processed foods – hot spots, skin conditions, bad breath, poor coat sheen, overall lack of vitality etc. How affordable is this food? How do I order this food? Send an email to us on lbworkingrotts@gmail.com or call 0412498809 / (03) 97445175 or send Laurie a private message on Facebook.